Skyline Theatre Company, Bergen County’s most established professional theatre company and in residence at the George Frey Center for Arts and Recreation in the Fair Lawn Community Center in Bergen County’s Fair Lawn, holds its annual gala and fundraiser on Monday, April 11 at 7 pm featuring an evening of performances from stars of current Broadway hit musicals. Hosted by Jim Stanek from the Tony Award-winning Broadway sensation “Fun Home,” the evening begins with a catered cocktail reception followed by a gala concert celebrating the musical genius of Stephen Sondheim. During the evening, Skyline will bestow its annual Horizon Award to ArtPride New Jersey. The Horizon Award is given in recognition to an individual or organization that shows extraordinary support of Skyline, its mission and programs. Selected by the board of trustees, this honor allows Skyline to show gratitude and applaud true supporters of the arts. Adam Perle, President and CEO, will be accepting the award on behalf of ArtPride New Jersey. The ArtPride New Jersey Foundation co-sponsors Discover Jersey Arts, the Alliance for Arts & Health NJ, and Art Matters with the New Jersey State Council on the Arts. The ArtPride New Jersey Foundation also serves as an information resource and broker between the arts and other public and private sectors. Research conducted by the ArtPride New Jersey Foundation underscores the value of the State's non-profit arts industry that generates over $1.2 billion in economic activity each year. The ArtPride New Jersey Foundation also partners with other arts service organizations to serve the field by providing professional development opportunities for arts administrators, in addition to protecting public arts support through grassroots advocacy efforts. More information can be found at ArtPrideNJ.org. The evening’s celebratory theme of the musical genius of Stephen Sondheim is in part due to Skyline’s next mainstage production of his smash hit award-winning musical, “Sweeney Todd.” Skyline’s unique take on this famously thrilling and shocking tale of love, murder and revenge will feature a cast of professional actors bolstered by a 20-voice choir and a chamber orchestra. The production take places one weekend only from May 20-22in Fair Lawn. More information is available online at SkylineTheatreCompany.org. 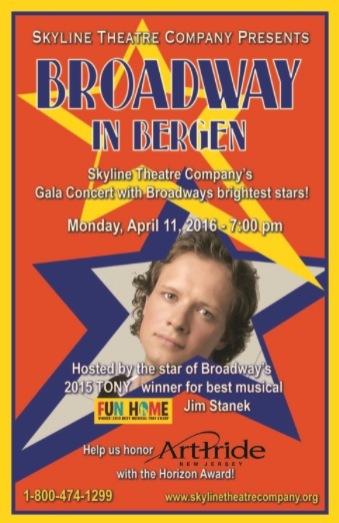 “Broadway in Bergen” gala tickets are on sale through Skyline’s website at SkylineTheatreCompany.org or via phone at 800-474-1299 and through BrownPaperTickets.com (event # 2321823). Gala tickets are $70 and a limited number of VIP tickets which include a champagne toast with the performers backstage prior to the event are $90. More information is also available via our social media platforms on Facebook at SkylineTheatreCo and on Twitter @SkylineBergen.